In 1918 the American, William R Gorham, went to Japan to manufacture aircraft and engines but the recession after World War 1 caused the venture to fail. Undeterred and due to his interest in vehicles, in 1919 Gorham built an experimental truck in a factory at Kawasaki City. He also built a special 3-wheeled vehicle for his disabled plant manager, Mr Kusibiki. As a result of his 3-wheeler the Jitsuyo Jidosha Seizo Co. was established and by 1920 it started to produce the Gorham 3-wheeler. 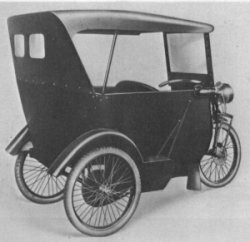 With handlebar controls, the Gorham was more or less a 3-wheeled motor-cycle with a semi-enclosed cab that had seating for three people. The driver sat centrally in the front with space for two passengers in the rear. Power came from an air-cooled, 2-cylinder, 8hp engine that had chain drive to the right rear wheel giving a speed of 30mph. This vehicle is said to be an important design historically as it influenced the fledgling Japanese car industry and many similar machines were built as commercial vehicles.